Description: Delaware & Hudson RS3u 505, Bellwood, Illinois, February 25, 1976, photo by J. H. Nixon, Chuck Zeiler collection. The exhaust stack is sealed with tape, I would suppose this locomotive is pictured on its way back to the D&H after rebuilding at Morrison-Knudsen in Boise, Idaho. 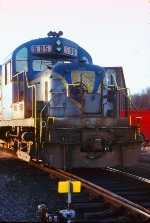 In late 1975, the D&H shipped 10 RS3's to M-K for rebuilding to M-K's TE 56-4A specifications, becoming RS3u's. Only eight RS3u's returned to the D&H (numbered 501-508), likely the other two units were used for parts. The orientation of the unit was reversed, and the short hood was chopped and became the front end. This particular unit was originally D&H RS3 4122 (c/n 80524), built August 1953. The major modification was the replacement of the Alco Model 12-cylinder 244D prime mover rated at 1600 hp with the 12-cylinder Model 251C rated at 2000 hp. The box on top of the hood behind the cab became the dynamic brake blower and resistors, re-located from the short hood. The long hood was raised six and a half inches to make room for the larger prime mover. Cooling, electrical, and control systems were all upgraded. This locomotive was scrapped in 1988. Description: Extra Board. Here is a postal card entitled "Bicentennial 1976." No Postmark. 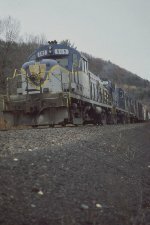 Caption On Reverse: "Delaware & Hudson Bicentennial RS-3u #1976 leads four more RS-3u's at Central Bridge, NY, on March 20, 1976. Photo by George Barker." #1976 was built by the American Locomotive Company as RS-3 number "4112" in September of 1952, rated at 1,600 horsepower, rebuilt as an RS-3u and renumbered "506," later repainted and renumbered "1976" in preparation for the US Bicentennial Celebration on July 4th, 1976. Also visible is D&H RS-3u #505. Gift from TRP Publications of Hanover, Pennsylvania. Description: On lease, and the way of the future! Description: With a PRR boxcar in the background, D&H RS3m 505 and RS36 5013 mix in with the black and blue power at Enola in May, 1977.